The holidays aren’t always the Hallmark card ideal for many families. Add an autoimmune disease and additional restrictions into the mix, and it can cause extra undue stress to an already stressful time of year. 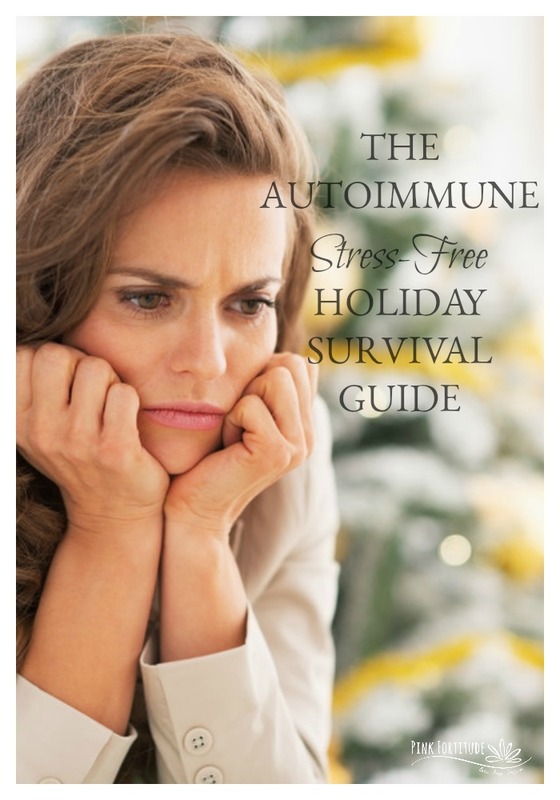 Here are some great tips and ideas to help you manage your autoimmune condition during the holidays and to help you enjoy your time with family and friends. You know what causes autoimmune conditions and flare-ups to get worse? Stress. These are some great tips to help you enjoy the holiday season without all of the extra stress. Growing up, my parents went out of their way to make the holiday season extra special. We had 30+ people around our table/s at Thanksgiving, including my Father’s international clients. For Christmas, we had a home decorated to the nines and piles of presents and traditions that wax nostalgia. Fast forward to Christmas 2010, I was in the middle of chemo treatment and was flat out sick over Christmas. I realized that as much as I love the memories and traditions of the past, the holidays are about being with family and friends and the spirit of the season, and not creating Pinterest perfection. I’ve kept that same spirit ever since. The year of “Chemo Christmas,” I explained everything to my family and laid it out very specifically and bluntly to them. It was difficult to do because I didn’t want to disappoint anyone. We spent a quiet Christmas in the living room. I ate Santa shaped jello and wore a Santa hat on top of my bald head. We survived and no one seemed to mind that we weren’t party hopping or that we missed Christmas Eve service at church. Fast forward again to Thanksgiving 2015. I had completely changed my diet and nutrition thanks to Hashimoto’s and was still trying to figure out how to eat and cope. Everything that was on the traditional Thanksgiving menu was off limits. I explained to my family that I wouldn’t be eating the same food, but not to worry, I’ll bring along my own. That year, we drove up to Pennsylvania to my parent’s retirement home. They had a lovely Thanksgiving buffet for the residents. I packed my own “Thanksgiving” meal in a lunch box and unpacked it onto an empty plate while everyone was at the buffet. It didn’t matter that I was eating my own food. The day was about being together as a family. You ARE going to get tired. You will probably have food restrictions. What do you need to communicate about? Make a list and do it ahead of time. If you don’t speak up for yourself, don’t expect anyone else to. Especially with family, if you don’t tell them that something needs to be different, they will never know. We live in a day and age where we only see the “A-side” on social media. You scroll through Pinterest looking at the most perfect decorations and food. You are envious of your friend’s posts on Facebook. Professional bloggers make their living by posting their perfect wares on Pinterest. And we all know no one’s life is perfect. I know so many people who post their “picture perfect” lives on Facebook to mask their own issues. Whatever you go through on a daily basis with your autoimmune condition (fatigue, pain, food, etc), keep your expectations in check that it may be worse over the holidays due to the increased stress. And please, please, please… do not compare yourself to anyone else. Not on Pinterest. Not on Facebook. Not your next door neighbor. Not your sister. Not your best friend. No one. It’s easy to get caught up in… well… everything during the holiday season. Make a list of what’s really important to you during these next few months. Imagine it’s January 2nd. Imagine if you were talking about the holidays to a friend you haven’t seen in a while. What were the highlights? What made you most excited? What were those special moments? When someone asks you, “how were your holidays?” what is the FIRST thing that comes to mind that brings you joy? THAT, my friends, is what you want to focus on. Start there. And keep your eye on the prize. It’s impossible to do it all, even when you are healthy. As Stephen Covey says, “first things first.” Know your priorities and stand firm. Whether it’s overtly or covertly, it’s not only easy to bring your own food, but it’s also a lot more accepted. It seems like everyone has some kind of food allergy or food protocol that they are on. I may even go as far to say it’s trendy. Which helps with understanding. Don’t feel like you have to appease anyone, put anyone out, be polite, or hurt anyone’s feelings. Bring a dish to share with everyone. And bring your own food and snacks as well. Eat ahead of time if necessary and enjoy what you can while you are there. In the video I’m sharing, I talk about how I packed snacks in my purse, pulled them out at a party and put them on the plate and just pretended it was the same food that everyone else was eating. Just like the Boy Scouts, always be prepared. Think through what could possibly go wrong and then plan accordingly. Be optimistic about everything going smoothly, but plan. It’s like packing an umbrella if the forecast is calling for rain. Activated charcoal and digestive enzymes are good to take before and after you eat as preventative measures to help in case you ingest something that disagrees with you. Whether you are entertaining at home, or at someone’s house, be sure to have these on hand. In case something does go awry, pack some Poop-Pourri for stinky visits to the loo. Spray it before you do #2 and no one will be none the wiser. As I mentioned above, keep a few small snacks in my purse. Just in case. The most important piece of advice for those with autoimmune, or anyone… is to practice self-care. Learn to say no if the event or request is not in alignment with your plan. And literally, carve out time FOR YOU. As the old adage says, you have to put the oxygen mask on yourself first before assisting anyone else. If you don’t take care of yourself, you won’t be any good to anyone else. Make sure you eat healthy and exercise, even if it’s gentle like yoga or walking. Take a nap. Take some time for meditation. Schedule a massage or pedicure. Carve out a few minutes of quiet. Pick up a good book. Don’t beat yourself up. Your self-worth is not how many cookies you made or how your home is decorated or how many parties you go to. Your self-worth is in your heart and what you give to yourself and others. Don’t get caught up in the craziness of the season. Take a few minutes every morning when you wake up and every night before you go to bed and practice your gratitudes. Either write down or think of 10 things that you are grateful for. It’s easy to feel down this time of year, especially when dealing with a chronic illness. Take some time each day to remember the good in your life and send your gratitude up to God and out to the universe. It’s amazing how grounded you feel after being grateful. Love, hugs, and wishing you a happy and healthy holiday season. Lots of great tips! As someone that has lived with autoimmune and food issues most of my life I can attest to the importance of all of this advice! Thanks for sharing!